Simulation of crop systems has evolved from a neophyte science into a robust and increasingly accepted discipline. Our vision is that crop systems simulation can serve important roles in agriculture and environment. Important roles and uses of crop systems simulation are in five primary areas: (1) basic research synthesis and integration, where simulation is used to synthesize our understanding of physiology, genetics, soil characteristics, management, and weather effects, (2) strategic tools for planning and policy to evaluate strategies and consequences of genetic improvement or resource management, (3) applications for management purposes, where crop systems simulations are used to evaluate impacts of weather and management on production, water use, nutrient use, nutrient leaching, and economics, (4) real time decision support to assist in management decisions (irrigation, fertilization, sowing date, harvest, yield forecast, pest management), and (5) education in class rooms and farms, to explain how crop systems function and are managed. The use of crop system models and simulation had its start in crop physiology, soil physics, and soil-crop-water processes. Early models focused mainly on the crop carbon (C) balance under optimum conditions, where only solar radiation and temperature were the driving variables. Simulation of crop canopy photosynthesis from leaf-level parameters was a primary focus (DeWit, 1965; Duncan, 1971), along with predicting crop development as described through their growth stages and examining strategies for increasing reproductive yield. These patriarchs of crop modeling soon advanced to developing simple whole crop models. 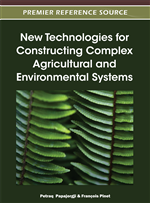 Concurrently, the early agricultural engineers and soil physicists were developing soil-plant-water balance models that predicted daily crop evapotranspiration, crop water uptake, and water flow processes in soils (Whisler et al., 1986). See Whisler et al. (1986) for an overview and history of crop simulation models up to the mid-1980s, including typical processes considered, data required, model testing, and applications. The crop aspects of many of the early soil-water-balance models were often fairly simple, estimating daily growth from light-interception and radiation-use-efficiency. The soil water balance models vary from tipping bucket one-dimensional water balance (Ritchie, 1985, 1998) to more complex Darcy-driven water flow with two dimensional flow such as 2-DSOIL (Ahuja, Ma, & Timlin, 2006) and RZWQM (Ma et al., 2003). The next improvement in crop system models came with the simulation of soil nitrogen (N) balance with a simple tipping bucket plug-flow of nitrate N to allow simulation of N leaching, but success was limited until improvement in two major components had occurred: first, the crop C balance routines needed to estimate crop N demand accurately and second, accurate routines to estimate soil organic matter mineralization are needed to estimate the supply of soil mineral N beyond that coming from applied fertilizer N. There are many published soil organic matter models (e.g., see Smith et al., 1997, who compared nine different soil organic matter models). The most frequently cited organic matter models are CENTURY (Parton, Stewart, & Cole, 1988) and ROTHC (Jenkinson & Rayner, 1977), and these models often serve as reference models for many studies (Traore, Bostick, Jones, Koo, Goita, & Bado, 2008). Each of these models has shortcomings, and there are many difficulties correctly simulating soil organic matter dynamics, even after 20-30 years of progress, because soils are so variable and soil organic matter is complex.